This brand is devoted to maximizing excellent internet access to common people to establish a connected world. Mercusys believes that the world of information and entertainment must be accessible by every human being. They will expand the ethernet region through its devices that are available in the market. The company involve with leading technical professionals and manufacturers to innovative products. They specialized in the field of Wi-Fi routers, Wi-Fi adapters, repeaters, access points etc. for the enrichment of internet connection that will appear in home & offices to increase the productivity. MW155R, MW305R and MW325R are some routers available at the lowest price in the market. 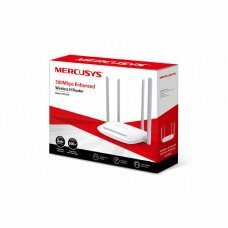 These wide and steadily covered routers can provide quality Wi-Fi connectivity to improve daily life. Star Tech has the best deals for the routers for online shopping or buying from stores. You can put your trust on the stable & high-quality products that will let you access to the digital world. Have the best price and deals all over Bangladesh to satisfy your online experience.